Uniquely tolerant and expansive in its world view, India is home to countless philosophies and belief systems. But however varied in its manifestation across Her length and breadth, there is an underlying unity behind this diversity-the culture of India is deeply rooted in spirituality. This can be credited in large part to the Rishis (sages), who taught the values of wisdom, love, compassion, truth, and selflessness —the essential universal principles of spirituality and established rituals and customs intended to preserve and pass them on to the future generations. These practices included temple worship; the four phases of life (study, family life, selfless service and renunciation); chanting of mantras; festivals; bhajans; sixteen major samskaras (rites of passage to be performed by or for an individual beginning with conception and continuing up to the last rites performed after death); and so on. Over the ages, these rituals gradually lost much of their significance as people began to perform them as a matter of routine, going through the practices without giving a thought to the meaning behind the action. Later on the study of Vedas, the performance of temple rites were confined to priestly class. Many restrictions were imposed on the common public in matters of worship. For example, householders were forbidden from chanting the Sri Lalita Sahasranama (1000 Names of the Divine Mother). It is believed that modern society is suffering as a result of this decline in values. 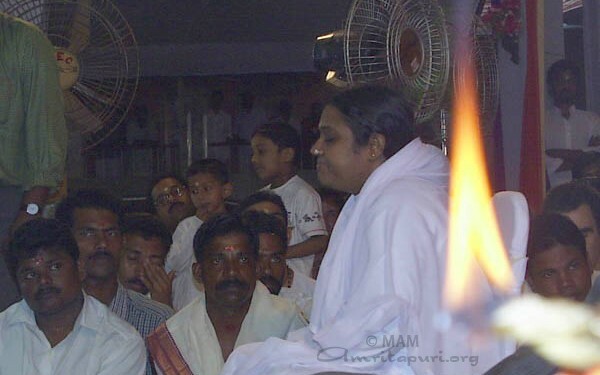 Over the past four decades, Amma has dedicated Herself to restoring these values and to bring home to the people true meaning and significance of many traditional rituals and festivals. She has also initiated revolutionary changes to meet the need of the times. She has encouraged all people—no matter what their caste, race, or gender—to chant mantras, perform pujas and even serve as priests. She lends her blessing and participation to many of the major samskaras, from teaching children the alphabet to performing the last rites; from wedding ceremony to sannyasa initiation. 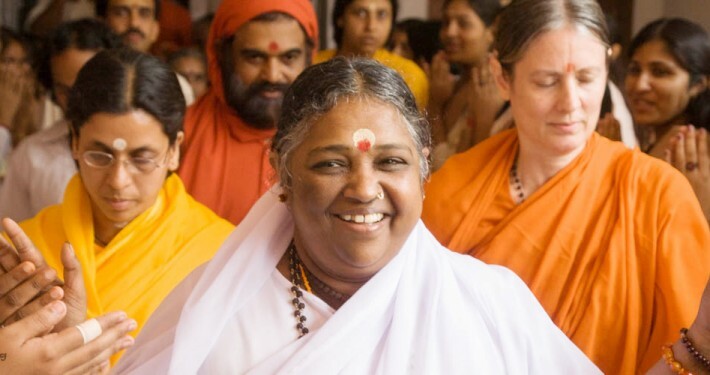 She gives mantra initiation to hundreds of people each week. And through simple dialogues, replete with telling anecdotes and logic she teaches the people about the importance of a spiritually oriented life, always stressing the practical application of spiritual principles in our life. Thus Amma has created a new awareness among the masses. It is easy to invoke the evil in humanity, but it is very difficult to invoke the good. Amma is asking her children to take up a life of love, sacrifice and service, dedicated to God. And millions all over the globe are heeding her call. This is Amma’s silent revolution. Before a super specialty hospital can be founded, before a devastated village can be adopted, before a forest can be rehabilitated, the minds and hearts of each individuals must undergo a transformation so they imbibe the spirit of selfless service and dedicates to that noble cause. Amma herself is the catalyst for this transformation. How does She do it? The answer is apparently simple. A hug, a smile, a few whispered words. One mind—one heart—at a time. Here is glimpse of what Amma initiates in the cultural and spiritual fields. In a revolutionary move, Amma’s temples has the stone murthi be carved with four faces, one on each side. After meeting Amma peoples lives irreversibly transformed for the better by Amma’s sweet words of soothing advice. Bhajans are prayers in song form, rich in meaning and full of devotional content. A person who has renounced all worldly desires and works for the benefit of the world. Whatever a great person does, that very thing others also do; whatever standard the great one sets up, the generality of humankind follow. 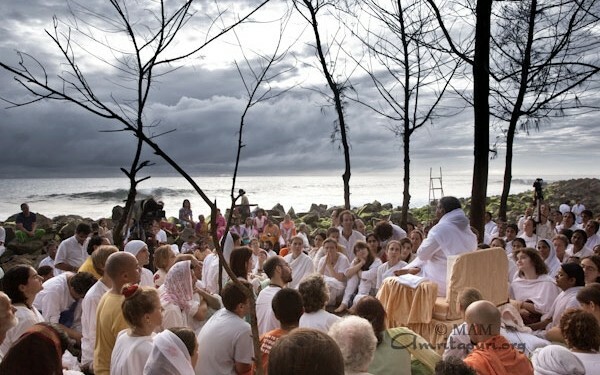 Amma brought forth the true meaning and significance of traditional rituals and festivals. Created some traditions of her own.